Dimensions: 9.8" x 0.8" x 11.2"
By David Pagel and John DeFazio. 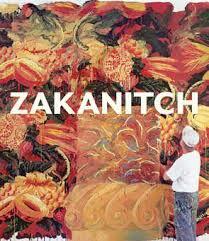 Illustrated by Robert Zakanitch. Published by Hardcover, 179 pp. This is the first monograph published on Robert Zakanitch, one of the founders of the Pattern and Decoration Movement. It includes more than 100 of his paintings done between 1962 - 2004.